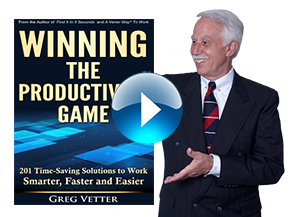 Online Course | Vetter Productivity, Inc. 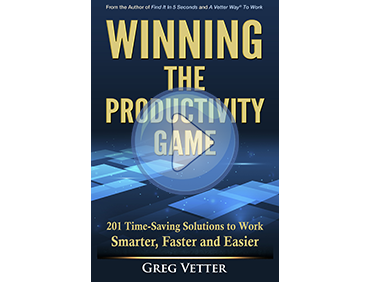 The course is based on Greg Vetter’s nationally presented two-day workshop, A Vetter Way® To Work In The 21st Century and on his book Find It In 5 Seconds. It teaches you a system of how to get organized and be productive in your workplace. You’ll be able to find all your information in 5 seconds and will learn a system of how to work specifically geared for the Information Age. Low investment for organizations that want to save training dollars. No travel is needed so time and money is saved. The course can be customized for your organization. Course test results are available to you online for each student. You have the ability to monitor each student’s progress. The online cost is much lower than the workshop cost. You don’t have time to sit in a two-day workshop. You want to spend time training on your own or at home. You don’t have large blocks of time to spend on training. You learn better on your own than in workshops. You like to learn whenever or wherever you choose, at your own speed, spending as much or as little time as you want. Each module is worth 3 credit hours and takes approximately 3 hours to complete. Any number of modules can be taken depending upon the need of the student. There are up to 6 modules (18 credit hours) available. The cost of each module is $44.95. The cost for all six modules is $249.95.